In this age of modern technology, the use of drum machines, electronic drums, triggered synthesizer drums, and samplers have become so prevalent on records, that it's becoming rare to hear real drums on rock and pop recordings. Sure, all of these new gadgets make getting a steady beat and consistent sound (maybe too consistent) a snap, but somehow it's just not the same. So I decided to dust off the old set of skins, and take a look at the fading art of getting a good sound from a real drum set. There are many factors which contribute to a great drum track. The player, the room acoustics, the drum set, the arrangement, and the recording technique must all work together to achieve the best result. Simply using the latest techniques, equipment, effects and musical styling is not enough to guarantee a good drum sound. Just because Joe Banana got a great drum sound using all of this doesn't mean it will necessarily work for you. 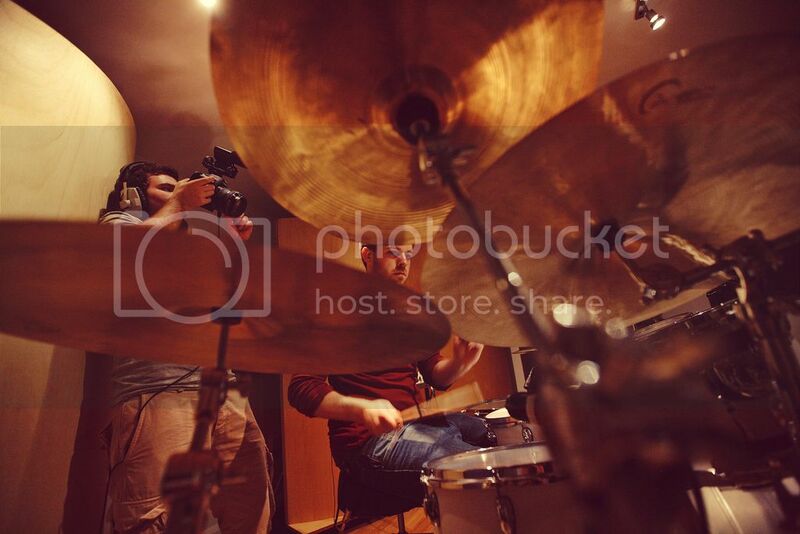 A good drummer will usually have a style and sound that will give you a solid starting point from which to work. The key to getting a good drum sound is to start with a good sound source. The more you know about the nature of the instrument, the easier it will be to achieve the sound you are looking for. Let's take a look at the basics that will affect the sound. Most drums are constructed from wood of fiberglass. Wood drums produce a warm, rich sound, whereas fiberglass rends to sound harder and louder. Snare drums are usually either wood or metal, each with its own sound, Bass drums and tom-toms are available in a variety of sizes, the larger the size, the deeper the tome and pitch it creates. The size and thickness of the cymbals affects the brightness, pitch, and length of sustain or ring. Drum heads are available in many types, -batter, pinstripe, oil filled (hydraulic), center dot, and others. Each type produces its own characteristic sound. Even the size and type of sticks (wood of nylon tips) will affect the sound. Tom-toms can be used with top and bottom heads, with the bottom heads removed, or with a hole cut in the bottom head. The bass drum may also be used with or without the front head, or with a hole cut in it. The size of the hole will affect the sound in both instances. Using two heads produces a louder sound with more ring and sustain, removing the bottom head yields a tighter, punchy sound with less over-ring. Good solid mounting hardware and stands should be used for all drums and cymbals. Check to be sure all drum lugs, wing nuts, washers, clamps, and other mounting hardware is free from rattles and vibrations. Avoid using bass drum mounted cymbal and tom-tom hardware. Every time the bass drum is struck, anything mounted on it will vibrate, creating additional tom-tom and cymbal ringing, which could result in a muddy sound. When mounting two or more tom-toms on the same stand, position them so that the drums cause a minimum vibration from one to the next. Keep some 3 in 1 oil on hand for those pedal and spring squeaks. Don't forget to check the seat for squeaks and rattles. If the from set has internal mufflers, be sure that they are free from rattles and buzzes. If the heads need dampening to cut down on ring, the use of external mufflers is preferred to the use of internal mufflers. The latter creates tension on the heads that is opposite to the tension created when the drum is struck. This chokes the sound, and also affects the way the stick bounces off of the head. Don't overlook tuning the drums, either higher, or lower, depending upon the desired sound. Tom-toms tuned to musical intervals in the key that the song is in works well. Tuning the snare higher will give it more snap and help it cut through on songs with thick arrangements. A thick lower snare sound works well for songs that have more room for the drums to breath. The bass drum tuning can be adjusted to afford more separation and clarity between the bas drum and bass guitar. The tom-tom and snare tuning should be adjusted to create a minimum amount of sympathic vibration (hitting on drum causes another to vibrate at a certain frequency). Retuning one or both drums will help. The drums are an acoustic instrument, therefore the acoustics of the room in which they are played will affect the sound. If the room is very live, the drums may ring too much. You can put up absorbent sound bafflers around the drums to stop the sound from being echoed through the rest of the room. Hanging some carpets on the wall will also help to reduce the reflected sound. If the room is large you may want to try placing the drums in a different location that is less reverberant. Room with paneling or hard surface walls and tile, wood, or concrete floors will create a live sound. Rooms with carpeting on the walls and/or floor will diffuse the sound even more, as well as reducing reverb. If the room is too dead (not enough reflected sound) the drums may sound dull and lifeless. Placing the drums on a sheet of plywood and placing reflective sound baffles around them will help liven-up the sound. Duct tape can be used on cymbals and drums to help control ringing. On cymbals, it should be placed on the underside. Experiment with the amount and position, and then see how it affects the sound. On tom-toms and snare, it should be place on the top head, but out of the playing area. A pillow or blanket can be used in the bass drum. The better you get the drums to sound in the room, the less you will have to compensate with equalization and microphone technique. Echo, reverb, compression, equalization, gates, and other signal procedures can be added during the mixdown, but these tools should be used to enhance a good sound rather than cover a poor sound. If you plan to gate the drums or trigger electronic drums from the acoustic drum kit, have the drummer play at consistent levels, and try to get good separation between the drums; this will help avoid false triggering of the gates or electronic drums. The addition of room microphones will add to the ambience of the sound as well as making any miss triggering less noticeable if blended with the gated or triggered sounds. There are many high quality microphones available today. The particular microphones you use become less important if the sound source is excellent. A good drum sound does not come instantly. Take the time to work with the drum set and room acoustics before you start setting up the microphones. The microphones you use, in many cases, are a matter of personal preference, or a choice of what is available for use at the time. There are about as many different ways to record drums as there are engineers and producers. Everyone seems to have their own method. There is no one way that is right for all situations and styles of music. You must develop a basic system that works for you, then adapt and modify it for the different styles and problems you may encounter. Experiment and let your ears be your guide.